Establishing a daily meditation is one of the best gifts you can give to yourself. Here are a few of our favourite pieces! Establishing a daily meditation practice is one of the best gifts you can give to yourself. We all dedicate a tremendous amount of time to building and nurturing our relationships with others, yet often sacrifice and forget the importance of self-love. Creating impactful and sustainable lifestyle shifts requires planning to ensure we carve out the time, space, and support tools required for lasting change. Setting a permanent meditation alter in your home will serve as a powerful reminder of your commitment to self-love and will also be a ready-made space that you can easily float into and out of daily. The practice of “Meditation” itself is commonly feared and often misunderstood. In truth, meditation can take on many shapes and forms, and does not necessarily mean sitting in complete stillness and silence, with the mind “empty” of all thoughts. Personally, I prefer to think about meditation in the the context of “being present”, the act of allowing any external distractions, worries and clutter in the mind to wash away. For me, I embrace meditation as an opportunity to truly tune in to the present moment and to bear witness to the interior landscape of my own body, mind and spirit. How can a Meditation Alter benefit me? A meditation alter in your home can be a physical representation and reminder of your commitments to self-love, growth, and evolution. A personal sanctuary, this space should be carved out in a quiet area, free of clutter, and if possible, filled with natural light. 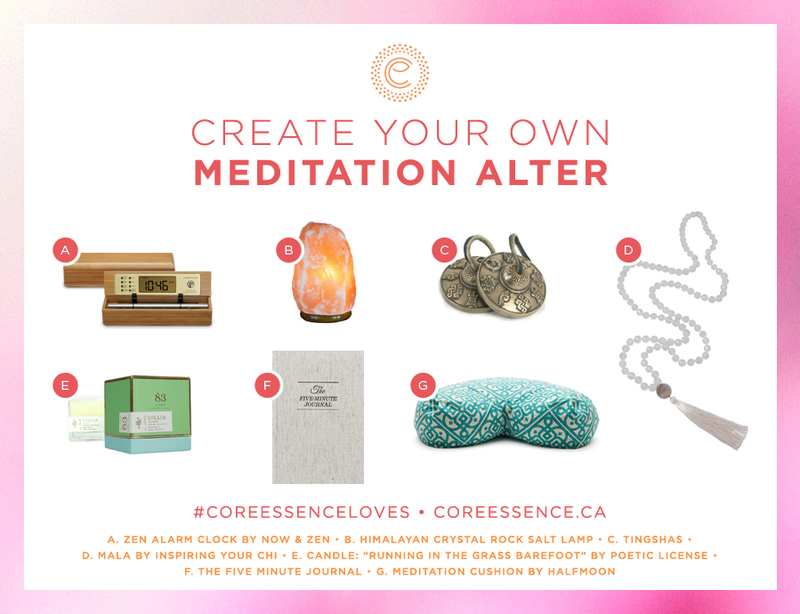 To support your journey into meditation, we have compiled a few of our favourite support tools that will help you begin the process of creating your own personal alter. Importantly, these items are simply a few of our favourites. Your alter should be a compilation of pieces that carry meaning for you and serve as a tokens and mementos of your own life journey and commitments to wellbeing. Why do we love these products/pieces? Zen Alarm Clock – offers a subtle chime progression that allows for a natural ease of awakening. So much more therapeutic than a blaring siren or the jolt of of latest pop single on the radio! Himalayan Crystal Rock Salt Lamp – these lamps help to purify the air, reduce allergies and improve mood, amongst a host of other benefits by producing negative ions which help offset the positive charge that can be generated by things like electronics (tv’s, computers, phones, other). In addition to the wealth of therapeutic benefits, these lamps offer a beautiful soft glow which is wonderful to enjoy while settling into your meditation practice. Tingshas – create a wonderful sound vibration that resonates in the body in a way that can be very soothing, therapeutic and cleansing. Mala – Malas consist of a total 108 beads and are a perfect counter for your meditation mantras through your practice. Added bonus – these malas double as a beautiful piece of jewelry! Poetic License Candle – A soy wax blend, each candle contains a combination of beautiful top, middle and bottom notes to bring to life the most delicious scents. The packaging is so beautiful as well – they will be a wonderful decorative piece in your home. Five Minute Journal – Have a peek and you will instantly see why we love this journal!